I am proud to tell you that I caught my very first VT team bass yesterday. It was on my favorite JB Custom Rod too! Honestly, I used that one rod 95% of the day. I bought two others from Bass Pro shop, but my hand hurts from holding the"heavy" weight, compared to the rods you sold me. I had planned on taking a picture with the fish and the rod in the same picture, but by the end of the day, the fish were just about dead. I took that picture with my partner, Mike Bylund, and tossed them back. Next time I will hopefully get a better picture, and hopefully a bigger bass!! ​And in case you are intersted in the tournament, it was at Lake Norman hosted by NC state. There were lots of fish, but no big ones. The winning wieght was 12lbs. Scott and Charlie got second, while Mike and I placed 7th or 8th. It didn't really matter to me, I was just estactic that 3/6 of my fish went into our limit. I just wanted to let you know that I haven't forgotten about you. First off I just want to thank John Ballard for his exceptional customer service. John goes above and beyond to make you a happy customer. I now own 5 of John’s rods and with each order I received my order when john said it would be here and 2 of them before they were expected. I have been using John’s rods now for about a year I am a tournament Bass Angler I fish both out of a boat in team tournaments and in individual kayak tournaments. I have been Bass fishing practically all my life; I have used rods I paid $600.00 to $700.00 for and I got to tell you John’s rods are the best it gets. They are super sensitive and super strong and John makes one for every fishing technique I fish. When I got my first JB rod I thought wow this is going to take some getting used to with the line guides wrapping around from top to bottom, but after fishing with the rod the first time I understood why John built them this way, after setting the hook on my first fish out of my kayak I noticed a much harder and straighter hook set with less effort. I think it is due to the rod tip not having to roll around as they do when the last line guide sits on the top of the rod as they do on most all bait casting rods. This to me helps a lot while fishing out of a kayak because of the limited leverage you have and often you are at a funky angle when you set a hook in a kayak. I feel this has helped me land more fish. Sensitivity is the best part of these rods I feel more with these rods than I ever have before. I was talking to John just today and I told him a story about a tournament I was fishing a few months back and I was fishing with the 7’3” Hunting Stik John made for me (this is a Med HVY Fast Rod) I was dragging along a Carolina Rig with a 1-1/4 OZ weight and with a 10” cigar worm at the end of it and so I felt a thump so I said what the hack hook sets are free, I set the hook started reeling in new I had something on the end of my line but didn’t know what and low and behold when I get it up its about a 2“ -3” baby blue gill. This is in 25’ deep water wind blowing 15MPM and I couldn’t believe I felt that little guy hitting my big oh bait. (He was fowl hooked in the bottom of his mouth). Anyway this post was manly to thank John for his great service and his great product also to let other kayak Anglers and Boat Anglers out there know there is something better out there to fish with these rods are a powerful tool you need in your arsenal. The sensitivity on these JB rods is off the hook but the fish are on the hook!!! 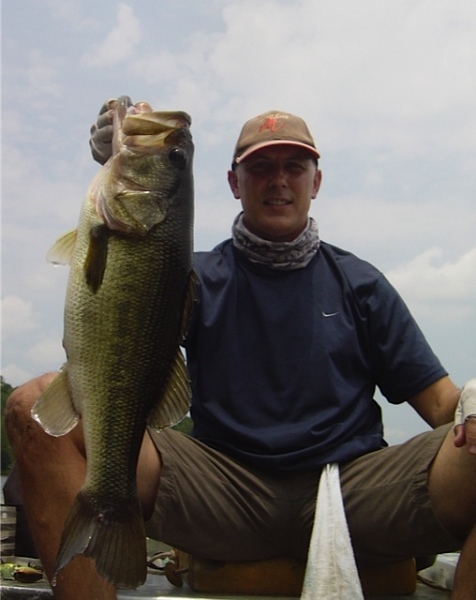 The kicker fish that won the Tournament on the James River July 09. Thanks to JB Custom Bass Rods, You have tried the rest, now try the Best. After a hot and grueling day fish were hard to come by, mostly just keepers for everyone, (Typical for the james this time of year). Thanks to a 5" Yamamoto cut tail worm, and a JB rod finesse spinning rod it came down to the feel of a very light bite. 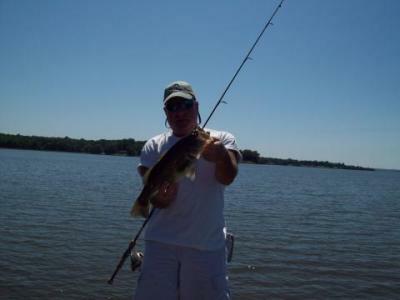 I wouldn't have felt him if it had not been for the sensitivity of the rod, so light was the bite of the 4 pounder, that no other rod on the the market would have come even close to a JB rod. I picked up a 7'6" southern spec rod from island tackle a couple months ago. I have caught a bunch of specs on it and have been really pleased. Today my buddy and I went searching for some trout. 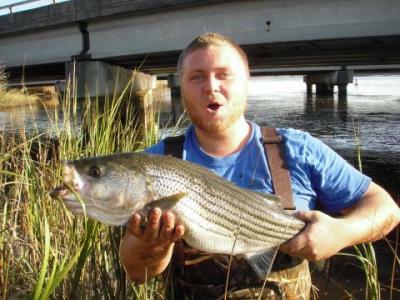 We happened to stumble upon a spot infested with striper. This rod held its own. I caught ten striper in one hour, one of them being a 10 pounder, and this rod performed great. I just wanted to let you know I am very pleased with it, and look foreword to catching more fish on it. If you email me back I'll send you a picture of the big striper caught on the rod. Let me start by saying that without a doubt JB makes the best crankin stick I have had in my hand. I asked John if it were possible to make me a crankin stick that would handle 3/4 and 1oz crankbaits when the rod was finished I went and picked up the rod I couldn't believe how light it was and thought, no way is this gonna handle those crankbaits. To say that I was suprised is an understatement, not only did it handle the crankbaits but it didn't have any trouble with a 9lb 12oz bass. I finally got a king on your rod and it worked awesome. Just wanted to tell you again that your rods are great! I already oredered a another fightin rod and anchored from you through island tackle. Man I'll never buy another rod besides a JB Custom. I'm hooked, keep up the awesome work you do! Forget about me ever throwing a worm with that rod!!!! Thats the best damn jig rod I ever molested with my dirty hands!!!! I won 2 bassboat tournaments at Jordan and one at Cammack and no telling how many fish I caught in the jon boat tournaments. That rod brought back my confidence in my jigs and if you catching fish on jigs you winning some jack!!! Going to get with you soon, need to visit you and toss around ideas for a 7 1/2 footer. 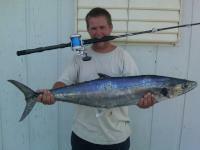 I SALTWATER KINGFISH AND WE JIG ALOT OF OUR BAIT ON SABIKI RIGS. I RECENTLY USED ONE OF YOUR RODS TO DO THIS WITH AND I COULD ACTUALLY FEEL GLASS MINNOWS HITTING THE RIG 3OFT DOWN FROM THE DECK. IF ANY OF YOU ARE WONDERING WHAT GLASS MINNOW ARE THEY ARE SALTWATER VERSION OF A CRAPPIE MINNOW THATS HOW SENSITIVE JBS RODS ARE ACTUALLY CAUGHT 4 OF THEM ON RIG, HOOKED IN THE MOUTH. OUR THANKS AGAIN TO JOHN OF JB CUSTOMS FOR CARING ABOUT HIS CUSTOMERS LIKE HE DOES. That jig rod of yours helped me win 7 tournaments in a row and the last 4 was 1st and big fish!!!! Won 3 bassboat tournaments and 4 jon boat tournaments since getting the latest rod. Thats 106.1 pounds of fish in the month of August. Hello my name is Tyler Hannon and I am 19yrs old and heavly addicted to fishing. currently I am prosueing a degree in Electrical Engineering at new river tech. college 10 miles west of virginia tech, and working at kmart not much but does support the fishing habbit and puts gas and oil in the boat to go to the lake on days im off. This email is to let you guys know you build one of the greatest rods i have ever had a chance to own and fish with. recently i just prchased a new jb custom snake rod with a brand new revo sx 2011 modle. this is my first jb rod but not my last. went into the store to add another st. croix to my already huge collection but walked out with one of yours and glad i made that decision. you make a great product and have a new customer for life. I have never fished with a rod that had this much sensitivity. The same day I purchased the rod a cold front moved in and I just wanted to cast it, so I went down to the water and started casting a ź oz. jig, I could feel every stick, rock and log. This Rod gives me a visual image of the bottom. 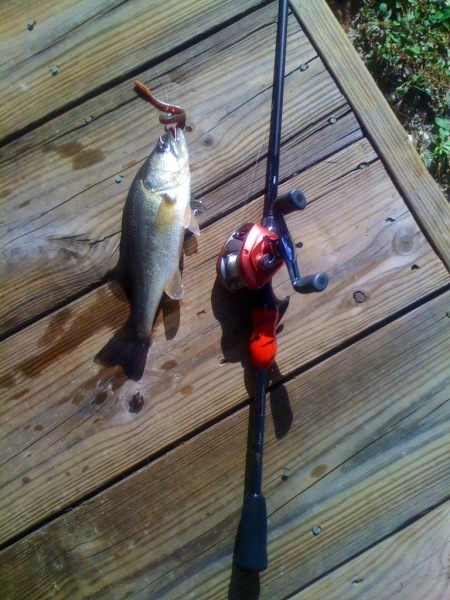 Then I felt it drop into the shallow creek channel and then felt something different; the lightest tick, I have never felt a bite so lite before I set the hook thinking it was small fish that would scatter but it was a 3-lbs bass. I continued for the next hour and caught 6 more that hit the same way. I know for a fact that if I was not fishing with a JB Custom "Baby Snake" was the model I would have never have felt those fish. I went back to the Outdoor show the following day to buy a spinning rod from John. I feel as though I have a better advantage this year going in to the BASS Northern Opens with these rods. What a wonderful rod. I've already put it to use and it's just as good as my Loomis NRX at half the price. Maybe you should charge more? Just wait until after I place another order which is something I'm working on right now. I need a good shallow water crank-bait rod and a quality spinning rod. Thinking about the Trap n Rap and the Shakey Man? Or maybe you have ideas for something custom that I'm not aware of? Let me know your thoughts when you get a minute. The best part is I'm the only one in my fishing club that knows about you - although I'm sure that's about to change! 8 pounder courtesy of JB Custom Rods ‘Missile’. Thanks John! This rod is the ultimate crankin’ rod. Power, sensitivity and impeccable craftsmanship!! I cant talk well enough about the quality and craftmanship of your rods. in one short year i have totaly changed my collection from other custom rods to that of the Highest quality. I am proud to wear the JB Custom logo on my Jersey and im sure my partner Lori will say the same. You will be proud to know there is no other rod manufacturer on my boat. We have made regionals this year and with the same sensativity those rods caught large mouths we will be putting them to the test on smallies in Sept.
thank you for making a superior product. We look foward to doing you proud and representing you in Erie Pennsylvania. Here's a pic of the very first bass I caught on your Baby Snake! Took the rod out the PVC and put a Daiwa Airy Red Pixy reel and a 1/16 oz Picasso shaky head jig with a 4 inch Squirrel tail worm....very, very light. Third cast, as I was shaking it on the bottom a bass picked it up. Very light but I could feel it. I don't think any rods I have now are that sensitive. Wow! Took the picture on my phone, and about 3 casts later, another one. In 20 minutes I had 4 bass! And I felt each one perfectly. I'll have to get used to the sensitivity of this rod......I could feel me pulling in a small leaf! The action of the Baby Snake was perfect for this finesse setup. And I really like the spiral guides...my first experience with them. I was concerned about the unusual shape of the grip, but found out immediately that someone knew what they were doing when they designed the short, contoured shape. The heel of my casting hand fit perfectly into the contour as I palmed the reel. What a great idea! When casting, the heel of my casting hand fit perfectly also...not too short, not too long. Wow! So, now I'll just have to figure out which rod I want you to make for me next!! Thanks so much for your quick personal service! I've never had such confidence in buying a rod. But as you said, once you use one, you'll come to understand just how good it is.